Cats Social House is located on Granville Island, which is really convenient since there's plenty of free parking. Everything on the menu is $18 or less. I like this place already! The Tahitian tuna bowl ($15) I ordered was served with roasted corn salsa, cowgirl salad and almond rice. The cowgirl salad was really good with candied walnuts, dates, tomatoes, corn, soybeans, feta cheese, and apple-miso vinaigrette. There were also a few slices of pickled ginger (the kind served with sushi), but I don't like ginger so I left it alone. 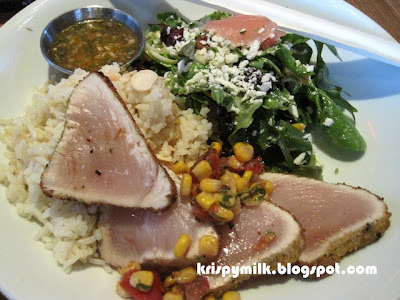 The tuna was nice and fresh and tasted great with the sour sauce. I think the outside was a bit overdone though. I loved, loved, loved the almond rice. I don't even like almond that much, but the almond rice was sooooo good! 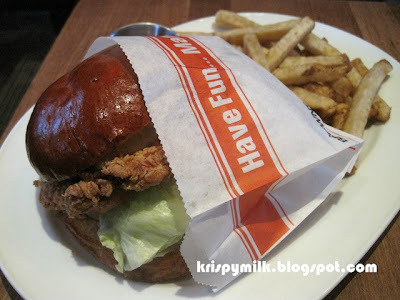 Dad got the spicy crispy chicken burger ($12) due to the server's recommendation. I had a bite and it was good. The bun was not soft and light like regular burger buns; the texture was much more substantial but I liked it. 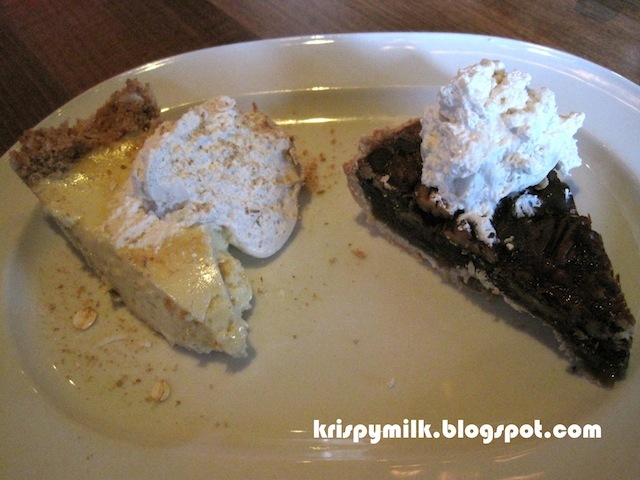 There were only 2 desserts on the menu: key lime pie and chocolate pecan pie, so we decided to get "little bit of both" ($6). As much as I liked the entrees, I have to say the desserts were disappointing. The key lime pie was an overly tart mousse without much flavour on a crumbly graham crust that almost fell apart before I started eating. There was way too much filling and too little crust, especially considering how tart it was. The chocolate pecan pie was better with a much richer flavour, but the top part of the crust was not there for some reason. Did it break off or did it not exist in the first place? Anyway just like the other pie, this one also had too little crust and too much filling. In any case, I would not order dessert here again. I loved the entrees, the prices, and the service. I will definitely come back when I have the chance.